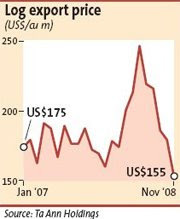 PETALING JAYA: Timber prices in the United States had fallen to their lowest levels since early 1990s, as the worldwide housing slump dries up wood demand for use in construction. The drop in timber prices was less severe for tropical hardwoods, local players said, but prices were expected to head lower as key markets the US, Europe and Japan fell into recesssion. “We are still getting good volume from Japanese buyers, but prices had gone down quite substantially compared with a year ago,’’ a company official at Sarawak-based Ta Ann Holdings Bhd said. Ta Ann exports timber logs mostly to India, while Japan is its biggest market for plywood products. The official said bad weather in Sarawak in the past few weeks had somewhat limited logging activities in the country’s biggest timber-producing state and this might help keep prices in check in the coming months. Lumber prices, however, are worst hit in the US. 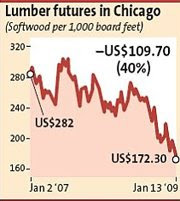 On the Chicago Mercantile Exchange, lumber contract for March delivery fell US$3.40 on Tuesday to close at US$172.30 per 1,000 board feet. The contract had dropped 32% over the past six months and is now down to its worst level since 1991. Home prices in 20 major cities in the US declined at their sharpest rate on record in October, depressed by rising foreclosures and weak sales. Bloomberg, quoting a Morgan Stanley report, on Monday said house prices in the US were likely to drop until mid-2010 because of growing unemployment, an excess of unsold homes and low levels of lending. The US is Malaysia’s top timber export market, behind Japan and Europe. Dwindling demand from traditional export destinations was compounded by the loss in new export markets. Eksons Corp Bhd said exports of plywood to the Middle East had almost dried up, as the construction boom in the oil-rich region came to a sudden halt as crude oil price tumbled. Analysts said local plywood prices were likely to head lower this year from mid-November levels after an uninterupted gain in the past nine consecutive months. The downturn had already prompted some timber firms, especially the smaller ones, to curb logging activities - at least in their own timber concession areas. Recent filings on Bursa Malaysia showed that Perak-based Leweko Resources Bhd’s log production in November was zero. This was due to the company’s shift in strategy to log in forest areas belonging to third parties to supply its sawmills. “We will start logging in our own area when prices recover,’’ a company official said. MALAYSIAN financial-to-property group TA Enterprise is still in talks to place shares of its TA Global unit despite weak markets, and is also looking to buy distressed property assets overseas, its deputy chief executive said. “We are currently talking to underwriters for the placement of our (TA Global) shares and exploring the best way to structure the IPO so that the market will be able to absorb the listing,” Deputy CEO Tiah Joo Kim said today. “In the event we do have to delay the IPO due to whatever reasons, we can always apply for an extension,” Tiah said in an email interview to Reuters. TA Enterprise said last September it would spin off its property assets for a separate listing on the local bourse. The property business will be housed under TA Global, a newly formed company to facilitate the listing. TA Enterprise, which houses the stockbroking and unit trust businesses, will remain listed on the exchange. Tiah said TA is still on the lookout to buy more property assets after a string of acquisitions last year. TA Enterprise’s cash and short-term investments stood at RM822.8 million (US$230.5 million) by the end of October, according to Thomson Reuters data. “The current economic downturn presents many great opportunities to acquire assets. We are on the lookout to acquire prime assets that are undervalued or distressed,” said Tiah. But the company will focus on markets outside Malaysia such as the hospitality industry in Australia, Canada and Hong Kong. “Local property prices haven’t fallen enough to excite us, Tiah added. The company’s earnings are unlikely to fall this year despite a weak operating environment, he said.